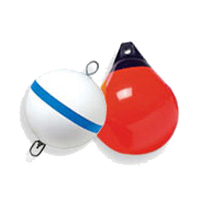 You'll find boat fenders for sale and boat bumpers for sale in all shapes and sizes to fit your type of boat. Our top manufacturers include Polyform, Taylor Made, and Hull Hugr. 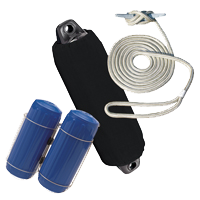 See our help guide below for guidance in choosing the best boat fender or inflatable buoy. Still have questions? We have answers to help you select the best boat fender or buoy. How Many Fenders and Where to Place Them? Diameter 3.5" 4.5" 5.5" 6.5" 8.8" 11"
Length 12.8" 15.5" 19" 22" 26.8" 30"
Diameter 6" 7.5" 8.2" 8.2" 8.5" 11" 11" 15" 15" 18" 21.2" 29"
Length 24" 26" 25" 30" 40.5" 30" 42" 41" 48" 50" 57.5" 76.5"
Diameter 6.3" 8.5" 10.5" 13.5"
Length 15.5" 20.5" 27" 34.8"
Diameter 11" 14.5" 17" 20.5" 27" 34" 39"
Model 3.5"x13" 4.5"x16" 5.5"x20" 6.5"x23" 8.5"x27" 10.5"x30"
Diameter 3.5" 4.5" 5.5" 6.5" 8.5" 10.5"
Length 13" 16" 20" 23" 27" 30"
Model 6"x15" 8"x20" 10"x26" 12"x34"
Length 15" 20" 26" 34"
Model 5.5"x20" 6.5"x22" 8.5"x26" 10.5"x30"
Diameter 5.5" 6.5" 8.5" 10.5"
Length 20" 22" 26" 30"
Model 6"x25" 8"x27" 10"x30" 12"x35" 15"x41" 19"x50" 24"x57" 32"x77"
Diameter 6" 8" 10" 12" 15" 19" 24" 32"
Length 25" 27" 30" 35" 41" 50" 57" 77"
Diameter 9" 12" 15" 18" 21" 27" 34"
Remove plastic screw from the valve (located near the rope hold), and insert the pump or air compressor. If using an air compressor, set your gauge at 2 PSI. Fill with air until the walls are fully expanded. You should be able to easily push in the walls about 1/4 of an inch. If no air is going in, insert a screwdriver or wire into the valve to push the flap open. To avoid over-inflation, measure the circumference of your inflated fender or buoy and match it with the value on our Maximum Circumference Charts below. Remove the pump and replace the plastic screw. This step-by-step video applies to the inflation of any brand of fender or buoy. A good rule to go by is 1 fender for every 10’ of boat waterline length, but no less than 3 total. When docking, place one fender at the beam (widest point) of your boat, and one both fore and aft. Space more fenders in between as boat length dictates. When rafting, group 3 standard fenders at the beam and one larger fender both fore and aft. Place all of the fenders on the moored or anchored boat. Hang your fenders from something solid like a stanchion base or deck cleat along the rail. Only tie them to lifelines as a last resort, as those are not as strong. Position the fender low enough off the side of your boat so that its bottom end is an inch or two above the water. Tie the fender line to your boat as close to the fender as possible, this helps to limit swinging. Vertical: This is typically the best choice for protection against flat surfaces like walls and floating docks. Horizontal: Useful for protection against cylindrical objects like pilings, because of the wide surface area that is protected. It’s also a good idea to tie a fender horizontally at fixed (non-floating) docks. Note: Recommended circumference values. Over-inflation may void warranty. HTM-2 26.7"
Hull Gard 3.5"x13" 11" Big B 6"x15" 18.8"
Hull Gard 4.5"x16" 14.1" Big B 8"x20" 25.1"
Hull Gard 5.5"x20" 17.3" Big B 10"x26" 31.4"
Hull Gard 6.5"x23" 20.4" Big B 12"x34" 37.7"
Hull Gard 8.5"x27" 26.7" Super Gard 5.5"x20" 17.3"
Hull Gard 10.5"x30" 33" Super Gard 6.5"x22" 20.4"
Tuff End Buoy 9" 28" Super Gard 8.5"x26" 26.7"
Tuff End Buoy 12" 38" Super Gard 10.5"x30" 33"
Tuff End Buoy 15" 47" Tuff End Fender 6"x25" 18.8"
Tuff End Buoy 18" 57" Tuff End Fender 8"x27" 25.1"
Tuff End Buoy 21" 66" Tuff End Fender 10"x30" 31.4"
Tuff End Buoy 27" 85" Tuff End Fender 12"x35" 37.7"
Tuff End Buoy 34" 107" Tuff End Fender 15"x41" 47"
Note: Recommended circumference values. Over-inflation may void warranty. Tuff End Fender 19"x50" 59.7"
Tuff End Fender 24"x57" 75.4"
Tuff End Fender 32"x77" 100.5"